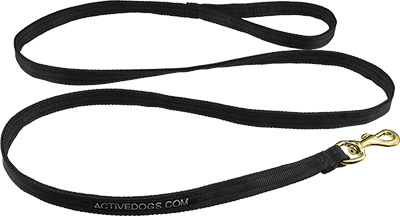 This Agitation Leash is made with 5/8" tubular webbing. Tubular webbing is woven in a continuous circle; and when pressed, it gives the webbing two layers of strong, durable web. They have a brass swivel bolt snap on one end and a stitched in loop handle on the other end. The ends are box stitched for added durability.